Annyeonghaseyo! You ought to know that I'm also into hoarding hair care goodies. Naturally, when I won a shopping spree at The Face Shop, I made sure to get one from its haircare line. I'm glad I did. 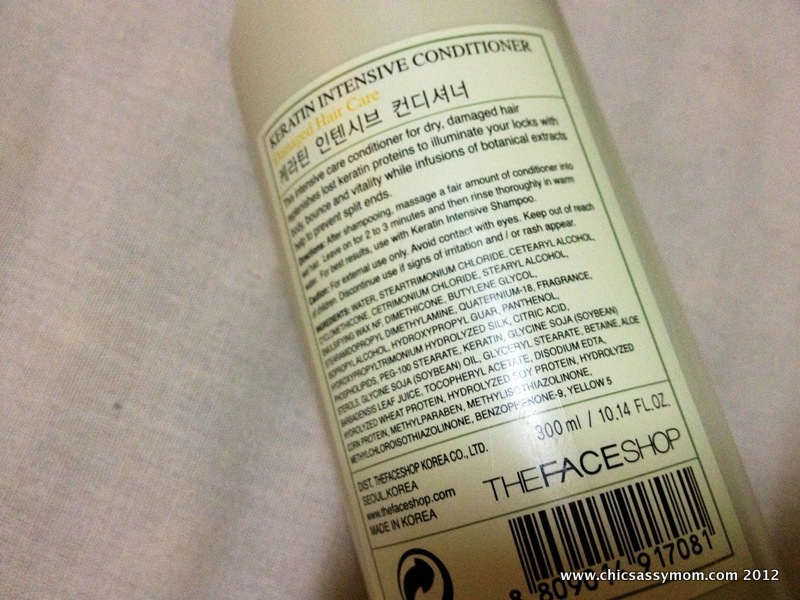 For the past weeks, I've been indulging in this uber nicely scented intensive conditioner. It's emptied to the last drop! 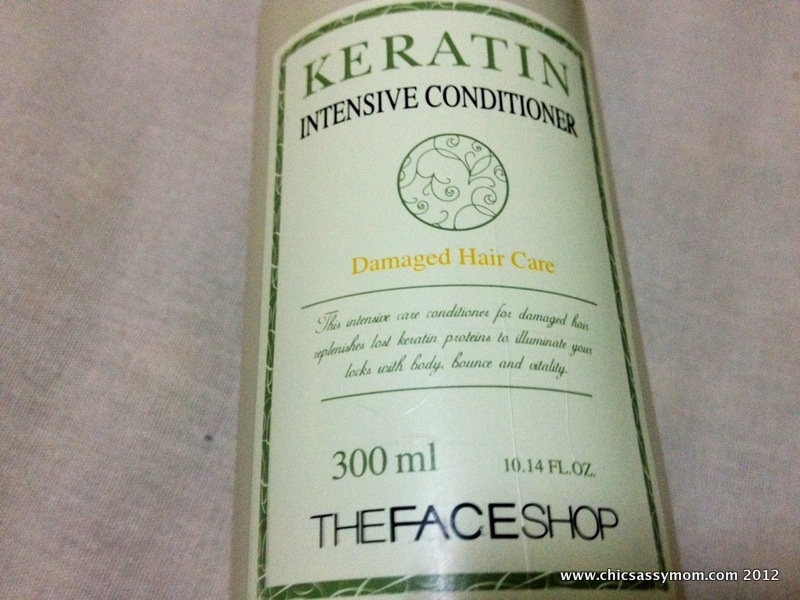 The Face Shop Keratin Intensive Conditioner for Damaged Hair Care sells for Php 350+ for 300ml. 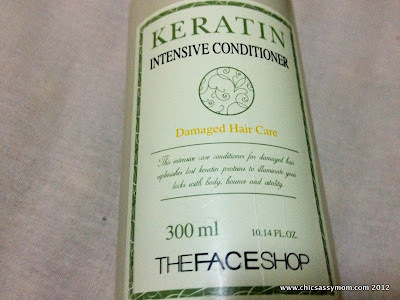 The Face Shop Keratin Intensive Conditioner Product Feature: The intensive care conditioner for damaged hair replenishes lost keratin proteins to illuminate your locks with body, bounce, and vitality while infusions of botanical extracts help to prevent split ends. Here's another intricate detail on usually is a trivial thing such as the pump head... leafy shaped complete with veins. 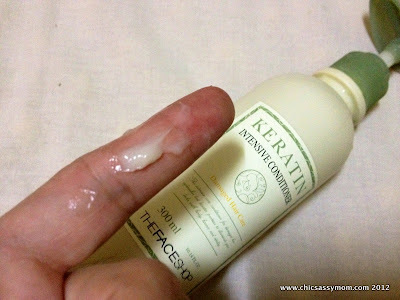 Truth be told, I've been saving this post, because I was hoping to do an emptied-and-repurchased post for a review, just to really prove a point. It used to be relatively within striking distance on my price threshold, vs. Beauty Credit Somang's Red Flo Red Camellia Conditioner, which sells online for Php 700+ for a 750ml bottle. 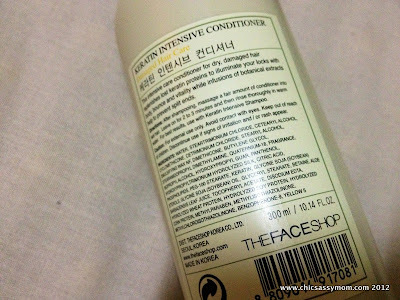 Until recently, I found a store in Subic Bay selling a 500ml Red Flo conditioner for about the same price as the The Face Shop's, so I caved in. But I noticed a major difference, true to The Face Shop's intensive claim, it does leave my more hair tangle-free even with all the rumpling going on when I twist and turn against my pillows when sleeping vs. Red Flo's. With The Face Shop's, it's almost effortless to freshen up the next day. Overall, I have a fairly manageable hair albeit being recently colored, because I snipped the worst part (in fact I was left with a bob cut then), but it's growing okay, except more often than not, it needs conditioner, a relatively exceptional one, to keep it soft and silky all through out. I'm also getting into a preventive mode, because I'm planning to get brighter hair colors with highlights very soon. I might need to pair it with a matching Keratin Shampoo the next time, just to savor its nourishing benefits. Boo me, but it's this photo again from last time. I just loved how easily I went from curls, to wavy wind-blown hair do the next time around. Even with hair tying as my go-to hairstyle, I can easily pull a sleeker hair style.